Main Street Parade on display Wednesday, July 4, 2018, in downtown McAllen. McALLEN — Dora Sanchez arrived an hour early to stake out a front row spot for the city’s annual Independence Day Celebration, lawn chair in tow. 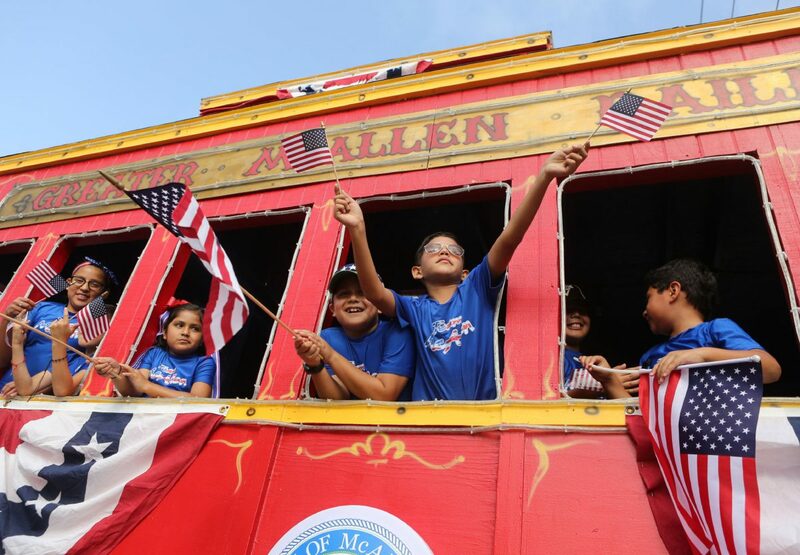 Now in its 90th year, the event marked the 52nd year the McAllen native has spent Fourth of July morning camped out on Main Street to watch the parade’s floats and bands wind their way through downtown McAllen. Attending the annual parade has been a long-standing tradition for the Sanchez family. This year she was joined by her sister and brother and two of their grandchildren. “It’s a tradition that we’ve been doing since we were little. It’s our fourth generation; it was my mother, me, and his mother (Sanchez’s daughter) and now him,” Sanchez said, pointing to her 4-year-old grandson Vincent, dressed in a crisp white shirt adorned with miniature American flags, flag in hand. The city’s Fourth of July celebration, which this year was sponsored by H-E-B, began with a patriotic program honoring local veterans. “I hope between the softball and the barbecues and the picnics and the fireworks, each of you will take a few moments to send a prayer of thanks; thanks to our forefathers for their vision and thanks for the military for their dedication,” said Donna Dillard, Texas American Legion Auxiliary department president. Like Sanchez, Yentle Hernandez was joined by two generations of her family — her children, and her mother, Estela Pineda. “I used to come with my parents, but they’re not able to now, so I come with my daughter and grandkids,” Pineda said. Her 10-year-old grandson Rául said his favorite part were the motorcycles that rode alongside the floats. After the floats had finished their half-mile route, the Sanchez family headed home, where they planned to watch the fireworks together, another family tradition.